A while back I noticed a cool food blog called LikeaLocal.cn when it went up on the China Blog List. I checked it out again recently, and it seems to have really taken off. It’s a great source for: (1) cheap food locations (in Shanghai), (2) cheap food order recommendations, (3) the Chinese needed to put in those orders (street food vendors don’t tend to be fluent in English). I especially enjoyed an entry misleadingly titled Strawberries. I call it misleading because the bulk of the entry is about how the street vendors will try to cheat you and how you can get out of being cheated. > Now you know how the scales work, but he will still cheat you! On the weight used to balance the stick in the photo it is written 250grams. Its actual weight is 225grams. The scale in the picture, and on most sticks I presume, is inaccurate (but always inaccurate in the seller’s favour). (BTW I bought my stick for 10rmb a pudong strawberry seller). The best way to prevent yourself being cheated on the weight is to make sure you have a 500ml water or fruit drink bottle (unopened) with you. Buy that in any convenience store. As you know, 500ml weighs 500grams. Now you can test his stick, scale, and weight by weighing your drink bottle. Cool huh? Get on over to Likealocal.cn. Good stuff. Magnets. Vendor would have a small magnet in his shirt pocket, which would draw the counter weight lower, thus you assume or he is telling you he is giving you more for your money. Pinky. When holding the scale in hand, the vendor would distract you or saw you been distracted and slightly press on the scale with his pinky finger. Once again, he is cheating you. Extra weight under the scale plate. 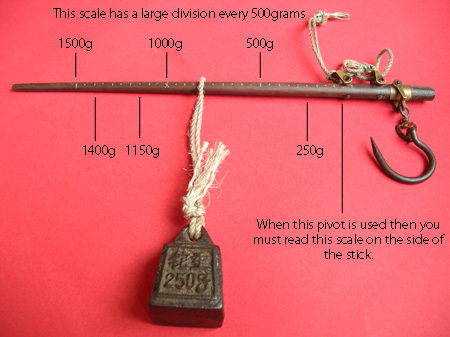 Some vendors would use lever-type scales with a plate instead of hook. Sometimes, extra weight is attached to the bottom of the plate. Lightened counter weight. With a lightened counter weight, it has to move further from the pivot point to balance out, thus cost you more money. Shortened scale head. Same idea as the lightened counter weight, except the scale’s head (between hook and pivot point) is shortened. These sticks or lever-type scales are actually called steelyards. I only know that because I chanced upon an illustration of one in an English dictionary when I was teaching in China. Just thought I’d mention it. The Likealocal site hits my stomach buttons nicely! Especially the latest post on fried dumplings which was my favorite food consumed in Shanghai. Though the point and principal is valid: cheating is bad, how to beat the cheat, effectively, the author is bitching about pennies. In this situation, you should trust the vendor and reward the legit vendors with your loyal patronage. This way, you’ll save time and stress, both of which are worth way more than the amount this strawberry vendor is cheating you with (magnets, pinky fingers, give me a break) and be happy rather than suspicious and angry. Either way, you either get a good deal or have a great story to share. I was really put off by the section in the original post on “how to cheat fruit vendors”. Selective price discrimination against wealthier trade partners is possible to reconcile with fairly universal principles of social justice. The opposite is not true. i seriously doubt its design was intended to cheat anyone, but more or less have a built-in profit margin that saves the vendor any fuss over whether he needed an accountant or not to tell him he’s in the black! the chinese vendor is merely being practical, he now knows he’s earning that margin (scale discrepancy) for every sale. simpler for everyone isn’t it? You guys don’t get it do you? It is not the point of a few pennies, they are CHEATING you. And this applies to other Chinese as well. There’s a difference between charging more and ripping you off on the backside. I got so frustrated at a guy once for paying his bill for six cellphones with a bag of coins. The telcom staff rejected one of his pennies and the guy just kept going on and on and on about how it was fine. I sat there thinking to myself, geez he doesn’t have another ONE kuai somewhere? I want to pay my bill and GO. So anyway, I tossed in a kuai and said here use this. Then I looked at the coin I got. It was falling apart. I tossed it back at the guy and said hey look it’s fake, see how it’s flaking! He thanked me profusely when he left. You two haven’t seen the magnets they sell to screw up the water meters? The fake Y50 and Y100 kuai notes I have, that’s $6, $12 bucks, real money. There’s a reason typical Chinese flood the big supermarkets like Carrefore, Walmart, because there’s less haggle and daily rip. I usually grab additional fruit and vegetables after the conclusion of the sale. I just smile and say don’t be so cheap. Hardly ever have they argued too much. And don’t think for a minute they are giving it to me at a loss. I’m watching the pinky finger. Does anybody know where I can pick up one of those scales to play with and actually figure out how it works? I have tried at wu jin dian’s but to no avail. How much does a bottle that holds 500 ml weigh? BTW, Lantian, I’ll bet that the fruit vendors don’t show you a pinky. I stop by a vendor. I see something I ~want~ to buy. The purchase costs say 10rmb for 1000 grams. See he is ripping me off, I fuss with 750 grams for 10 rmb because he ripped me off 2.5 yuan. My day and his day is now ruined over my pride and his petty greed. Then I wake up and realise. If the vendor said 15 rmb 1000 grams and I used my trusty electric scale and I bargained him down to 12.5 would I still be so sensitive?